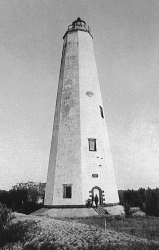 On December 23, 1794, the Bald Head Island Lighthouse was lit for the first time. The lighthouse, planning for which began in 1783, was the first one authorized in North Carolina (the second was Ocracoke for which plans began a year later). In 1789 Benjamin Smith, who recently had acquired the island, promised the state ten acres for use as a site for a lighthouse. Congress appropriated funds for the lighthouse in 1792. The state legislature levied a tax to help fund the beacon. Around 1812, the lighthouse was damaged beyond repair due to the effects of soil erosion. Congress appropriated $15,000 for a replacement. Daniel Way accepted the contract in July 1816 and finished the new lighthouse the following year. Use of “Old Baldy,” as it is known, was discontinued in 1835. The oldest lighthouse on the North Carolina coast, it was placed on the National Register of Historic Places in 1975. “Old Baldy” is distinctive for its eight-sided design. Modern restoration efforts have returned the lighthouse to its nineteenth century appearance. A reproduction of the 1850s keeper’s cottage stands alongside the sentinel.